Home » Food and Nutrition » Can Eating Nuts Lower Your Risk of Death? In a new study published in the June 2015 issue of the International Journal of Epidemiology, researchers discovered that people who ate at least 10 grams of nuts per day had a 23% lower chance of death over a 10-year period from respiratory diseases, neurodegenerative diseases, and diabetes. The lower risk of death went as high as 45% for respiratory disease! Can Nuts Really Help Us Live Longer? In a 1986 study performed through the Netherlands Cohort Study, approximately 120,000 Dutch citizens (58,279 men and 62,573 women) between the ages of 55 and 69 years old participated in a 10-year observation. Researchers wanted to investigate the relationship between the intake of nuts (tree nuts, such as almonds, cashews, walnuts, and pecans, and peanuts) as well as peanut butter and mortality rates. Before the study began, each participant provided personal lifestyle and dietary information to the researchers. The study was conducted using the case-cohort method, where study conclusions are based on answers from data-entry questionnaires and supported by data analysis. The questionnaires issued questions about dietary intake, smoking habits, medical conditions, and lifestyle factors, as well as nut and peanut butter consumption. Researchers specifically wanted to know the portion size and frequency of the nut consumption. Researchers discovered that the male participants had an average daily intake of 14.5 grams of nuts and women had an average daily intake of 8.5 grams of nuts. Concerning peanut butter, men consumed an average of 4.5 grams per day and women consumed 3.6 grams per day. The results? Nut intake (although not peanut butter) was linked to lower mortality rates for both men and women, including a decreased risk of death due to a variety of diseases, including cancer, diabetes, neurodegenerative diseases, and cardiovascular and respiratory diseases. Nut intake was related to lower mortality; researchers determined that a decreased risk of death occurred for participants who consumed between 10 to 15 grams of nuts or peanuts per day. Eating more than 15 grams of nuts per day did not lead to a further reduction in mortality. No preventative benefit from peanut butter was discovered; researchers suggested it might be due to the hydrogenated vegetable fat generally found in peanut butter. Researchers noted that nut/peanut consumers also ate more fruit and vegetables and women who ate nuts were leaner; study results were adjusted accordingly. 1. Keeps your appetite at bay: Peanuts have high satiety properties, which means that they will make you feel fuller than you actually are and will keep that feeling for longer periods of time. 2. Low-sodium food source: One ounce of salted, roasted peanuts contains 119 mg of sodium, which meets FDA standards to be considered a low-sodium food. 3. Keeps your heart healthy: In a study published in the Journal of Nutrition, researchers discovered that participants who included peanuts as part of their daily diet reduced their risk of suffering from a coronary disease by 35%! 4. Protects against colon cancer: Researchers have discovered that by consuming peanuts at least twice a week, women could reduce their chances of getting colon cancer by 58% and men by 28%. Go nuts! 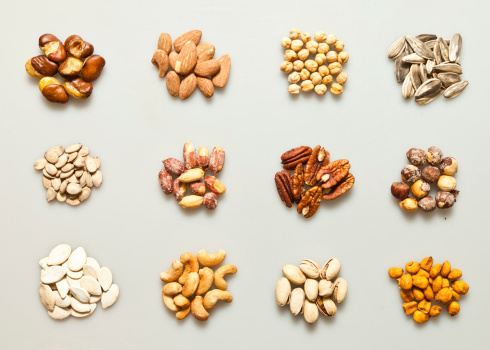 If you don’t have any dietary restrictions—then aim to include a handful of nuts into your daily diet and you will reap the benefits! Berenson, T., “Eating Nuts Could Save You From an Early Death, Study Says,” Time web site, June 11, 2015; http://time.com/3917463/nuts-early-death/. Perry, M., “5 Health Benefits of Eating Peanuts,” Cooking Light web site; http://www.cookinglight.com/eating-smart/nutrition-101/peanut-health-benefits, last accessed June 12, 2015. “Try Salted Peanuts for a Low-Sodium Snack,” Peanut Institute web site; http://www.peanut-institute.org/images/materials_11_2722028706.pdf, last accessed June 19, 2015.